The Ovation Tangent T347 is an electro acoustic guitar which means it can simultaneously play the sounds of a DJ turntable and the chords of Redemption song. It’s part of the Tangent series “Metalheads take a hippie break”; so the guitar has a special look and is (of course) black from A to Z. Dave Mustaine used a guitar of the same serie for the acoustic shows of Megadeth few years ago. The T347 has a mapple top and the body is made of carbone fiber which is less sensitive to humidity changes than wood. The big advantage is that the strings don’t detune inconveniently at each hygrometry change. And that is very very likeable. Bought new at 750€ in 2004, I used it for years. The thing I don’t like on this guitar is the same thing on almost every Ovation : it’s the rounded back (the carbon fiber part I just talked about). The guitar will likely slip when I play, so I don’t have a pleasant grip instead of my other guitars. I heard the rounded back better reproduces the vibrations of the strings than wood, that’s why they use it at Ovation. There’s also another back with a less rounded shape on some other guitars of the brand which gives a better grip on the instrument. The acoustic sound is OK, no more. Very Ovation, some people love it; I find it lacks a bit of warmth. But the thing I liked a lot is the OP30 integrated preamp . I was blown away by the sounds coming out of it the first time I plugged in the guitar. The integrated tuner does the job very well. Talking about the preamp settings, check the video below to compare the Ovation T347’sound with the OP30 and the same sound recorded with a classic microphone, the Shure Beta 58A. 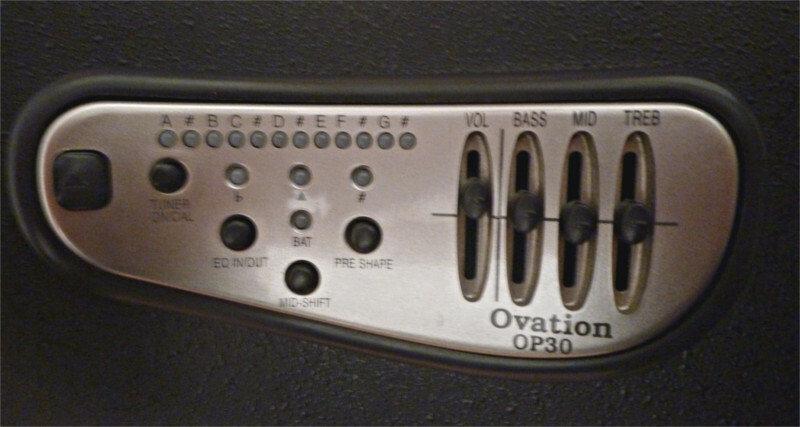 The OP30 Eq is set flat (volume, bass, middle & treble at 0). The aim was to hear what color it was bringing to the sound when turned ON.The guitar & the mic are directly plugged into the soundcard / DI & recorded on my DAW (Reaper). No further audio treatment (EQ, compression…) has been done after the recording, you hear the raw sounds. To conclude, the sound & the look are special enough for this guitar to be the instrument of your life or make you regret turning off your TV when Sarah Palin was about to talk. The proverb “Play the instrument before you buy it” is especially true for this guitar.